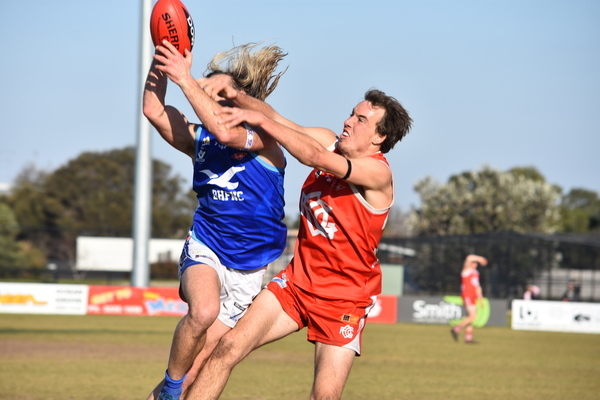 Barwon Heads won its ninth consecutive match over arch rivals Ocean Grove in a brutal Battle of the Bridge clash at Ray Menzies Memorial Oval on Saturday. Final scores Barwon Heads 11.12 (78) defeated Ocean Grove 7.10 (52). 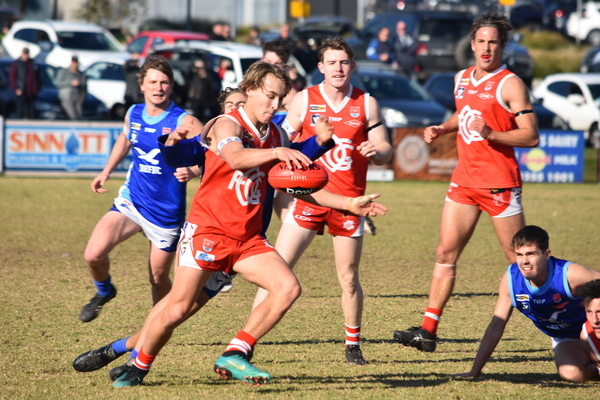 BFL ladder leader Barwon Heads (13-1) sealed the minor BFL premiership to be three games and percentage ahead of nearest rivals Anglesea (10-4) and Geelong Amateur (10-4). The 26-point loss relegated Ocean Grove to fifth spot with an 8-6 record. Players from both teams were left bloodied, bruised, concussed and suffered a spate of injuries. Grubber captain James Linton suffered severe bleeding from the nose after a collision, Kieran McNally required stitches following a head clash and Matt Caldow sustained a first half concussion. Wounded Seagull trio Sam Harris (knee), Michael Philp (knee) and playing co-coach Bobby Wallace (ribs) all went down. Harris the most serious injury – play was brought to halt in the first term after he was stretched off. 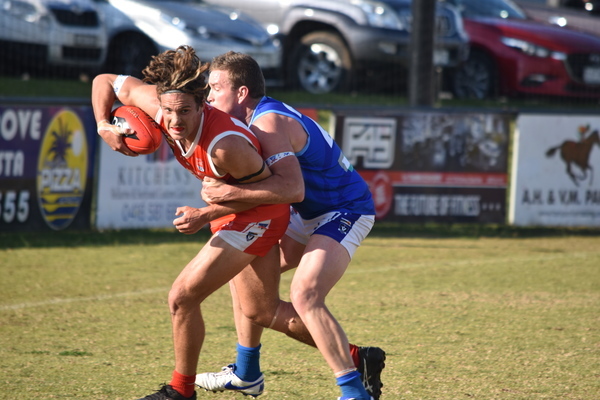 “Sam Harris strained his medial ligament – it is a shame for him to miss a few weeks now,” Barwon Heads co-coach Mitch Herbison said after the match. Herbison said it was a physical and tough contest. “Both teams will be pretty sore after that one,” he said. It was a hot first term – only three goals were scored, but the Grubbers rose to the occasion and matched the Seagulls’ intensity and led by four points at the first break. Barwon Heads was in front at half time and three-quarter time. Ocean Grove coach Paul Lynch commended both teams on their attack on the footy. “I thought we competed really well and the tackle pressure and all that was excellent – and they (Barwon Heads) were too,” Lynch said. “Other than on the scoreboard I thought it was pretty even contest. Lynch admitted the Seagulls were more polished than Ocean Grove with its disposal after half time. “Single-handedly the difference was their ball use was better than our ball use – that was the game in itself,” he said. Despite the loss, there were several encouraging signs for the Grubber players. 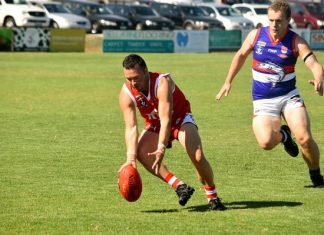 Key Ocean Grove defender Justin Carey, a former St Albans GFL player, won his match up on the dangerous Herbison, who was held goalless for only the second time in 2018. “I think Justin’s CV is as good as what ‘Herbie’ probably is – only that he is a little bit older,” Lynch said. Herbison, a multiple South Barwon GFL premiership player, declared Carey took the honours. “He (Carey) did a pretty good job too – so he probably took the chocolates,” he said. Grubber ruckman Andrew Jarvis, the sole BFL representative named in this month’s Vic Country Squad, was a standout in the ruck, while youngster Isaac Wilkins continued his rise with efficient ball use. Karl Staudt booted two goals for the Grubbers and Barwon Heads-based BFL equal leading goalkicker Mitchell Phelps snared four majors. Phelps has now kicked 50 goals from 14 matches in 2018. MEANTIME Ocean Grove will meet reigning BFL premier Torquay this Saturday. The seventh-placed Tigers face an uphill battle to make this year’s finals with their 6-8 record after they suffered a demoralising 63-point loss at the hands of Anglesea on 14 July. Senior game starts at 2:10pm at Spring Creek Reserve. Goals: K. Staudt 2, K. McNally, T. Gavin, J. McDonald, L. Cartelli, H. Walker. Best: A. Jarvis, I. Wilkins, J. Carey, R. Maloney, H. Walker, G. Campbell.